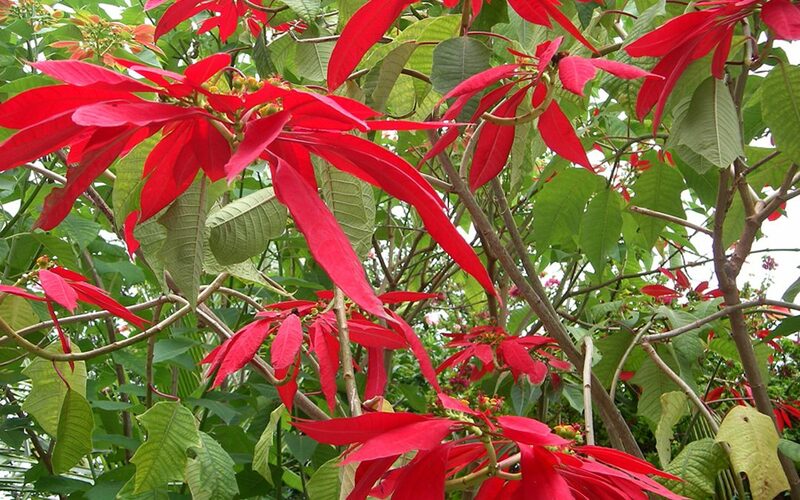 This is a poinsettia tree in Vilcabamba. 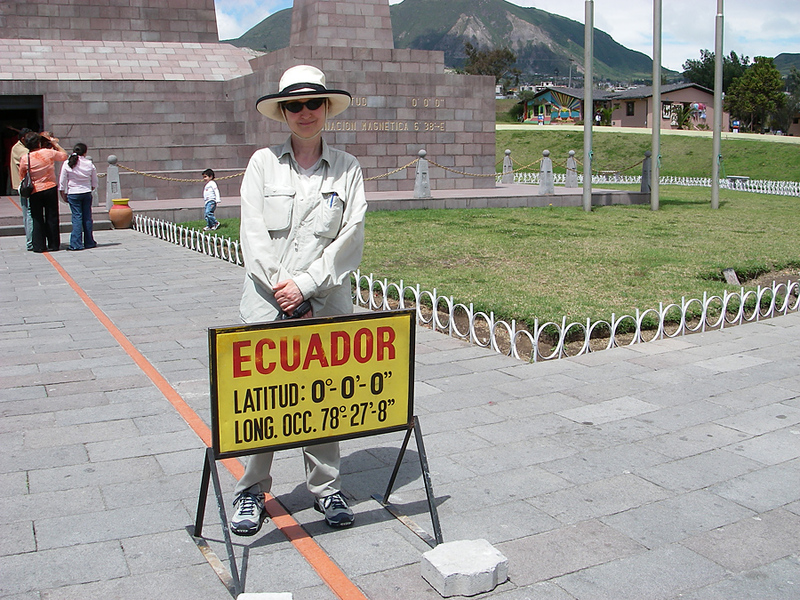 For my blog post this week, I want to return to Ecuador. Last time, I told you about The Eleven Hour Bus Trip. 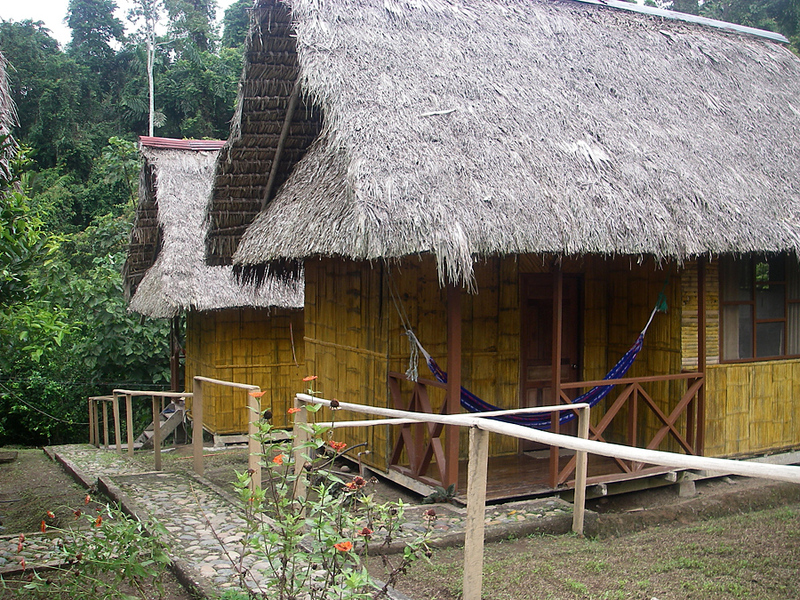 Now it is time to leave Cuenca and go to Vilcabamba. 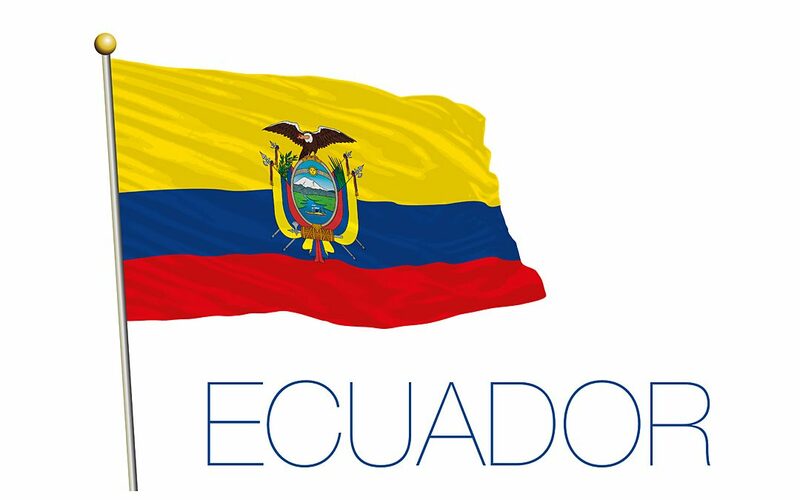 For the rest of the Ecuador story, go here. The bus ride from Cuenca to Vilcabamba was a little better because I got the front seat, right by the door to the driver’s cabin. There was a blue curtain across the door, but I kept pulling it back whenever people got on or off. Besides the driver, there was one other ‘helper’ up there, and sometimes there were two helpers. Keeping my eyes on the horizon was good—I was not as nauseated. The helper seemed a little nervous about me being able to see him. I figured out that half the reason the bus wound so much was because the driver was avoiding potholes, like Hans Solo avoiding asteroids. At one point, one of the helpers moved the curtain over a bit more to block my view, but Rolf could still see the driver, who was eating fried chicken—with both hands—while one of the helpers was reaching across and steering. This trip was only five hours long. There were no bathroom breaks and my bladder had lost all tone by the time we arrived in Loja. We had a bit of food at the bus station and waited for the connecting bus to Vilcabamba. This last leg of the journey only took an hour and a half. Our hotel is owned and run by a French couple. Everything works and is ultra clean. We look out on a garden and there is a hammock on our porch. 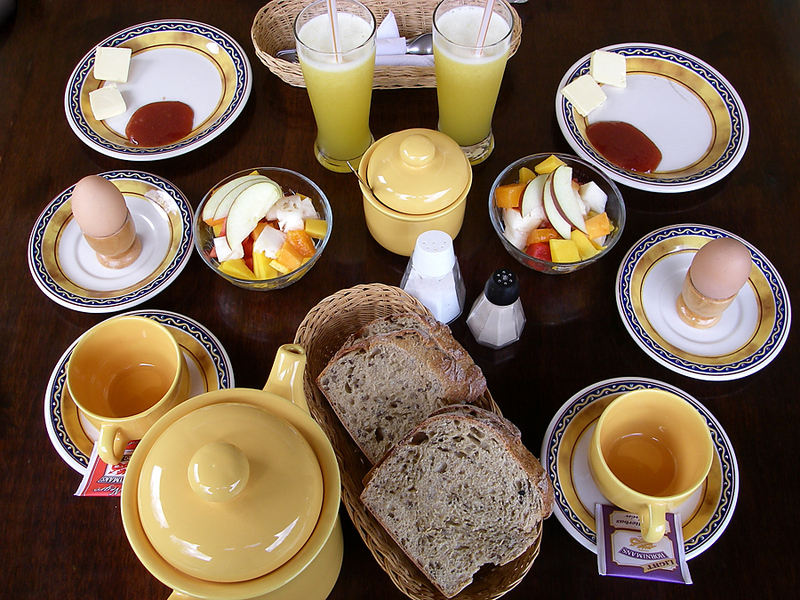 Breakfast is served on the table outside our door—juice, tea/coffee, egg, fruit salad and homemade multigrain bread. I think I’m going to like it here . 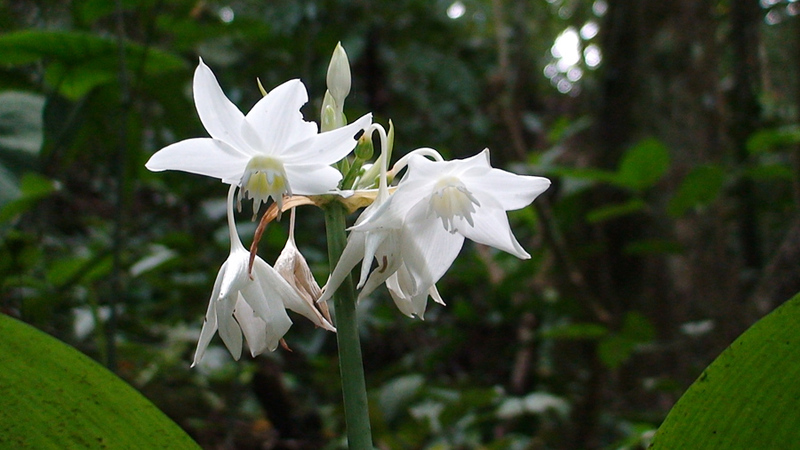 . .
It’s time for another story from my 2007 Ecuador trip. Last time, I told you about The Jungle. 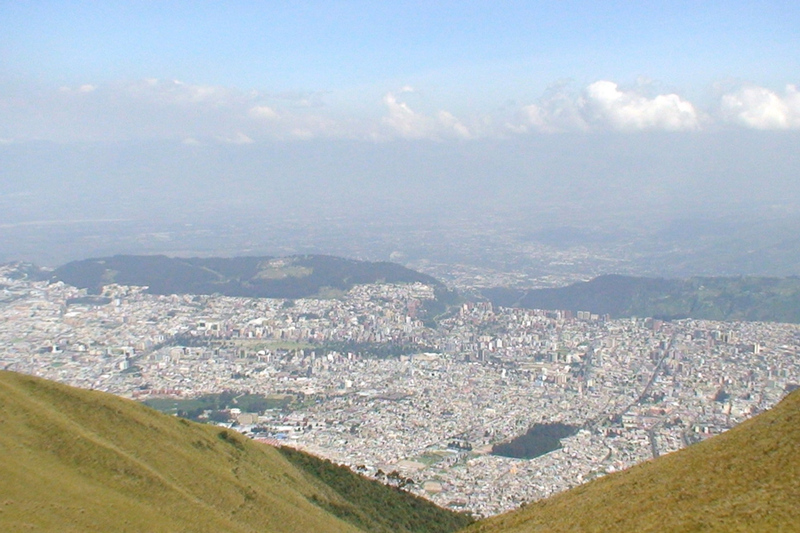 After that adventure, we rested up in Quito for two nights. 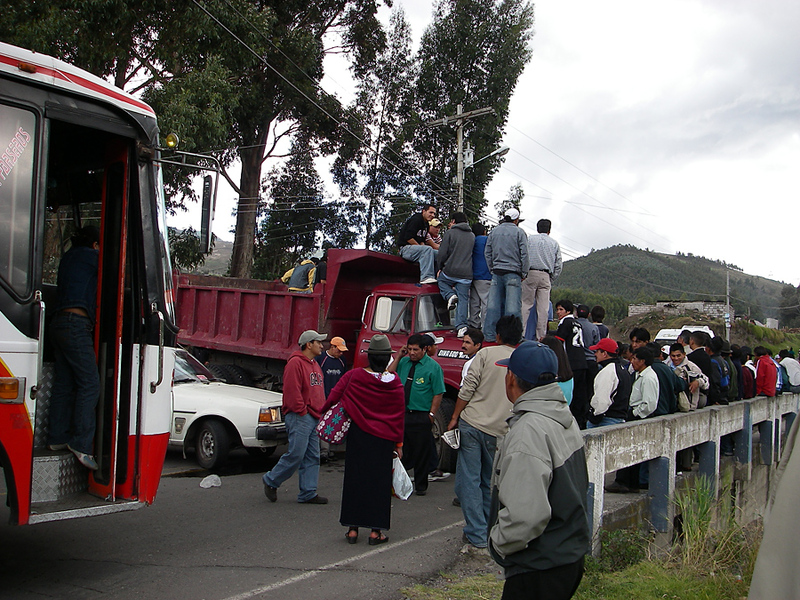 Then we boarded the bus for Cuena—it was supposed to be an eight-hour trip. We are safely and comfortably in Cuenca for a few days. On Tuesday, we left Quito on the bus at 10 in the morning. Once we get the packs loaded, we go to the bathroom. The toilets don’t have seats but they are clean, and toilet paper only costs 15 cents. The bus leaves on time at 10 and as we are pulling out of the terminal, a young man walks through selling litre bottles of yogurt, followed by another guy selling bottles of water. Sort of like an omen that we will be here for a long time. Then the first sales presentation starts. The place where the driver sits is separated from the rest of the bus. There is a glass divider and a door, and an orange curtain behind the glass divider so you can’t see where you are going. This might be intentional, so you cannot see where you are going on those narrow mountain passes. You probably don’t want to know. But for me this is a problem, because I can’t keep my eyes on the horizon. I am sitting by the window so I get a peripheral view, which is not as good as looking straight ahead. On the glass divider there is advertising about how this bus “Sucre Express” has music, DVD, baño, and is safe and punctual. There is also a sketch in red lines of Jesus with a crown of thorns – with the red lines contrasting against the orange curtain. Sort of like, if you think You are suffering, consider how Jesus felt . . . The sales presentation continues. I think the guy is selling ginseng. Costs $4.50 in stores, but for you, because he cares so much, it’s only $2.00 a bottle. He believes in it so much he would give it to you for free but he can’t. There is a magic demonstration where he adds “toxins” to a glass of pure water to represent the coffee, alcohol and fast foods that go into our bodies, and then he adds a magic pill and the brown water changes to clear. It might have been more effective if he had drank the water after, but he throws it out the window. He lets people hold the bottles of pills. No obligation. And he points out the writing on the bottles, how this is a prestigious laboratory, how the bottles are hermetically sealed, etc. Then he collects the bottles back and – the most amazing part – some of the people purchase them. An hour into the trip, Rolf has to pee. The door to the baño is locked so he goes to the front and knocks on that door. The driver has a helper who has the key. But the helper says that the baño is only for the señoras. Rolf disagrees and he gets to use the toilet. I use it too. Very tricky on these bumpy, winding roads. Of course, there is no water to wash your hands but I have my little bottle of alcohol cleanser. I can’t help it, I’m a nurse. I’m sure the locals think I am loco. Or is it locA? At Latacunga, two ladies in red shirts and caps board, carrying Tupperware containers of helados for 50 cents each. Homemade ice cream on a stick wrapped in a baggie. I get coconut, which tastes very good and the cold helps with the nausea. It would be better if I could see straight ahead but that only gives me the orange curtain and the suffering Jesus. New passengers have boarded, and now another guy does another sales spiel on ginseng. He competes with the scratchy music from the loud speakers. He finishes and makes a few sales. We stop somewhere. Quien sabe? The driver says 15 minutos and disappears. I decide to use the bus stop’s bathroom. Bathrooms in this country are a special experience. I carry my own toilet paper. Use some to wipe the toilet seat – this place has a toilet seat, and it is wet. These toilets do not flush but there is a barrel of dark water with a plastic jug floating in it. I think the idea is to dump water in the toilet to ‘flush’ it – which is why the seat was wet before. I only peed, so I don’t worry about it, and besides, I just don’t want to reach in that barrel. Of course there is no water to wash your hands, but I pour a good dose of alcohol on my palms and rub for 15 seconds. Meanwhile Rolf is grabbing a bowl of soup at a restaurant, which has a clean bathroom (he later told me) and even running water. However, he was sick the next day, so who knows about the soup. It’s about 2 pm, and so far I have only eaten that ice cream so I buy a sealed little package of Ritz-like crackers. Which are good for the nausea. I return to the bus, since the 15 minutes is up. And I wonder where the driver is. The motor is still running. I get a window open for air. We are the only turistas on this bus and the locals don’t like anything bordering on cool. I sit by the window and sip water and air. And watch out the window. The median in the road has an overflowing barrel of trash. A lactating dog crosses the road to the barrel, puts her paws on the top of the barrel, and searches. She finds a neatly tied green garbage bag, removes it, and carries it down the median. Then she sits down with her lunch between her paws and rips open the bag. She finds a takeout Styrofoam tray which seems to have a good meal left because she is eating for a long time. Then the tray blows away along with the rest of the bag’s contents. The trip continues. There is a third sales presentation. About 3:20, the bus pulls to the side of the road and the driver and his helper get out, followed by just about every male passenger, including Rolf. I hear someone say “peligroso” – dangerous. I get out too, with my daypack – never leave anything behind. We stand on a cliff and look at the blocked road below. The men are dispersing, peeing on various bushes. Women are out of the bus too. 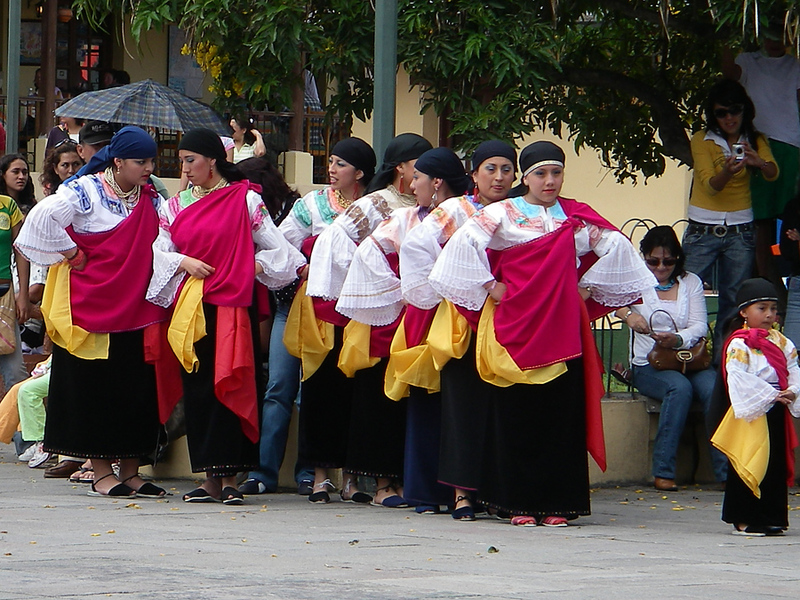 Many wear the indigenous uniform – hat, frilly knee-length skirt, colourful shawls. One is knitting. The decision is made to drive to the blockade. Everybody runs back to the bus with the same enthusiasm as if we are off to swim at the lake on a hot day. At the bridge below, a large truck is placed crosswise on the road, with its front tires flat. The duals at the rear are okay. There is no traffic on the other side of the bridge, because another truck blocks the bridge on the other side of the pueblo. 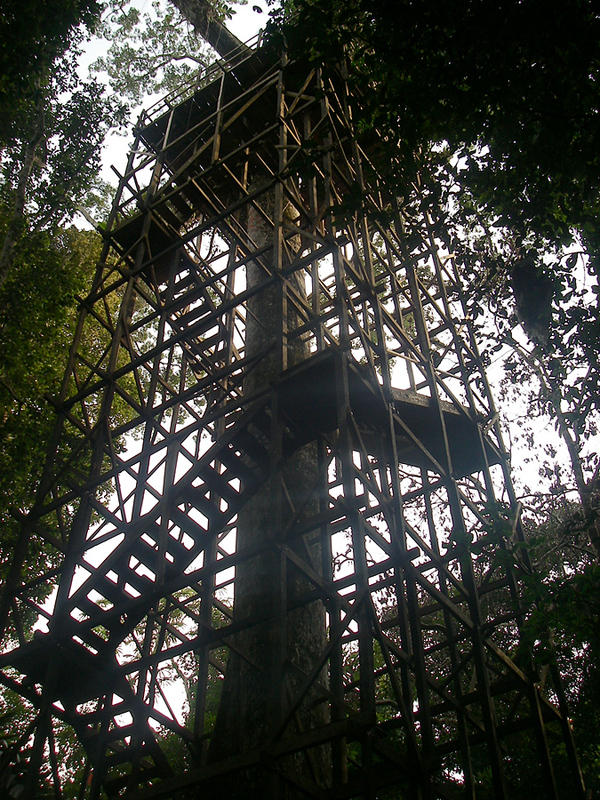 This is a small indigenous settlement forgotten by the government and the rest of Ecuador, and demanding some attention. At this point, some guy comes through the bus selling banana chips. A good sales opportunity. There are no police or military but the media is there, with two cameras. Rolf talks with one of the other passengers, a metizo (not Spanish, not indigenous, a mix). We meet a lady from a different bus, Susan, from Vancouver. She has actually worked with a Belgian volunteer project at this pueblo and she tells us about the poverty here. The children get fed once a day, at breakfast, some boiled gruel. She ate the same gruel, got sick and left, and now she is touring. The volunteer project was teaching English and Computers, if you can believe it. The place actually has a computer, except it doesn’t work. They teach concepts on a white board – another story. Nothing happens for about an hour and a half – except the men are crawling all over the truck and seem to be enjoying the diversion. There is no leadership. Or at least no one is taking charge. There are several buses in the building line-up of traffic. They seem to be waiting for the police to arrive, maybe. They do try rocking the truck, with about 30 men pushing. But the tires don’t roll. Eventually, some guy gets an idea. I see him go under the truck and he is pulling some lines. I was afraid they might be fuel lines, and that he was going to blow up the truck, but what do I know? I tend to get paranoid around crowds. But then Rolf figured out that the guy was disconnecting the brake lines. And now the truck, even with the flat front tires, can roll. The indigenous who have been monitoring our progress, now start to place rocks in front of the tires. Rolf crawls under the truck, removes a rock and tosses it in the river. This makes the travellers happy. There is renewed effort to push the truck to the side. And, amazingly, all of this is happening without anyone in charge. 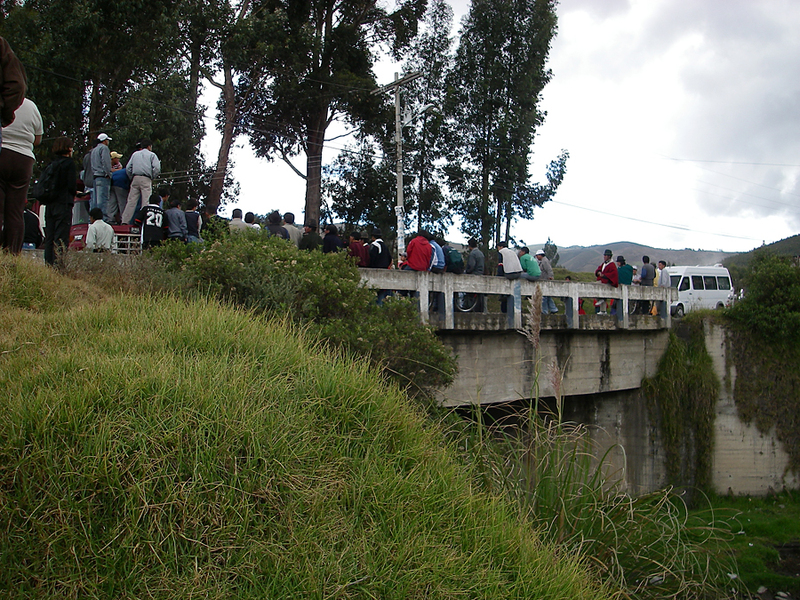 As soon as the truck is almost clear to move off the bridge, another vehicle starts to crowd forward – to be the first one across. However a bus at the front, needs to back up, just a bit, to allow room for the blocking truck to be moved. The people seem to figure this out, and then they are backing up vehicles. 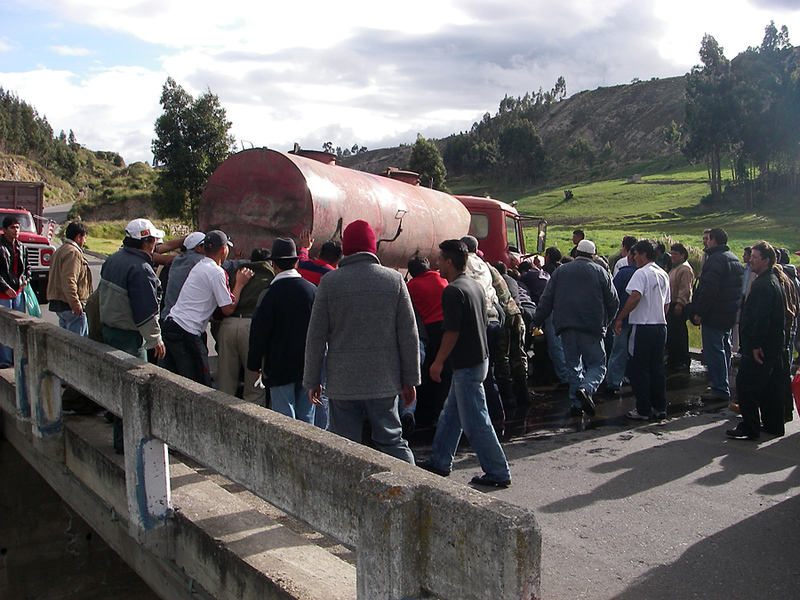 Thirty men, including Rolf, are pushing the truck to the side, and then there is room to cross the bridge. During this time, the indigenous are peaceful, throwing water and not rocks. We get through the pueblo, to the next blockade. Our bus’s men pile out, move the next truck and we are on our way. It is about 5 o’clock, there is another hour or so of daylight. The scenery is pretty, if you like rolling green hills that make me think of Ireland. But the effect is somewhat marred by the roadside garbage, with the dogs rooting through it. After dark, about 6:30, it is rainy and foggy, and I don’t get to see much of the Incredible Scenery. I do see, out my window, the muddy gravel road, and I hear the blare of horns as buses meet each other on said road. And I feel about as sick as I have ever felt with nausea. At 9 pm, we arrive in Cuenca, find a very nice hotel, and I swear off buses for life. Except I have to get on another one tomorrow. I’m not sure I can do it. I may be stuck in Cuenca forever. who now remembers that there is such a thing as Transderm V for motion sickness – but you can’t buy it in Ecuador. 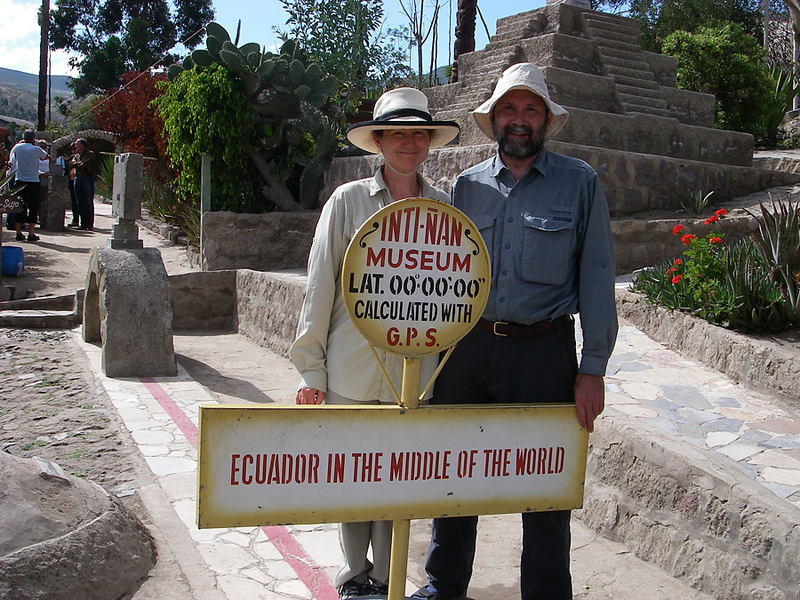 The story of my 2007 Ecuador adventure continues. This is a letter I wrote home after our two weeks in the Galapagos and our one week in the jungle. The Galapagos Islands are incredible. I knew they would be. I just didn’t know the heat would be so much. Getting back on the plane for Quito was wonderful. 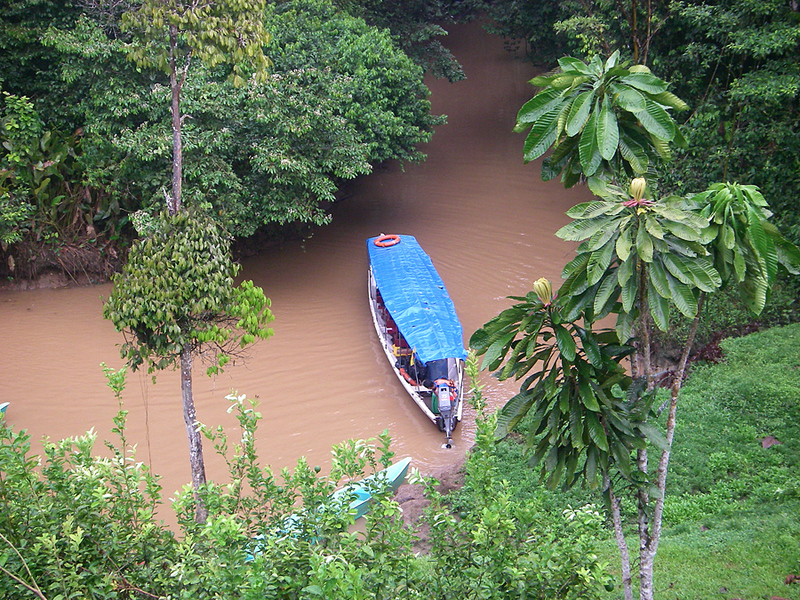 We spent less than a day in Quito, and then flew to Coca, where we took a 45-minute boat ride down the Napo River to the Jungle Lodge. This was also hot, but only 29 degrees Celsius (in the shade) and there was major humidity. Very nice for your skin. 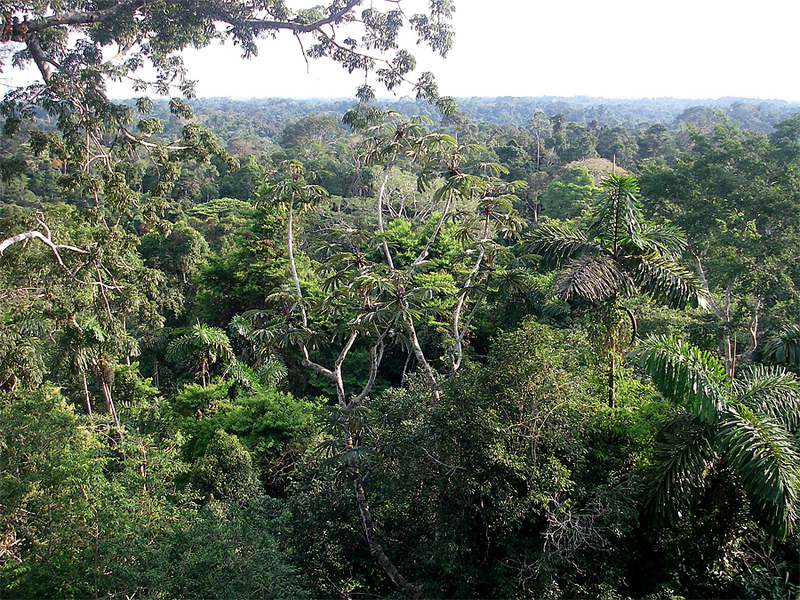 I did a few jungle walks with the naturalist before I gave up. I think my stomach reacted to the Malarone (for malaria) or maybe it was just the heat. I don’t do heat well. That was me, lying in bed at night, with my ankles sweating, while I listened to all the interesting jungle noises, the cicadas, the frogs. One frog sounded like a construction vehicle when it’s backing up. 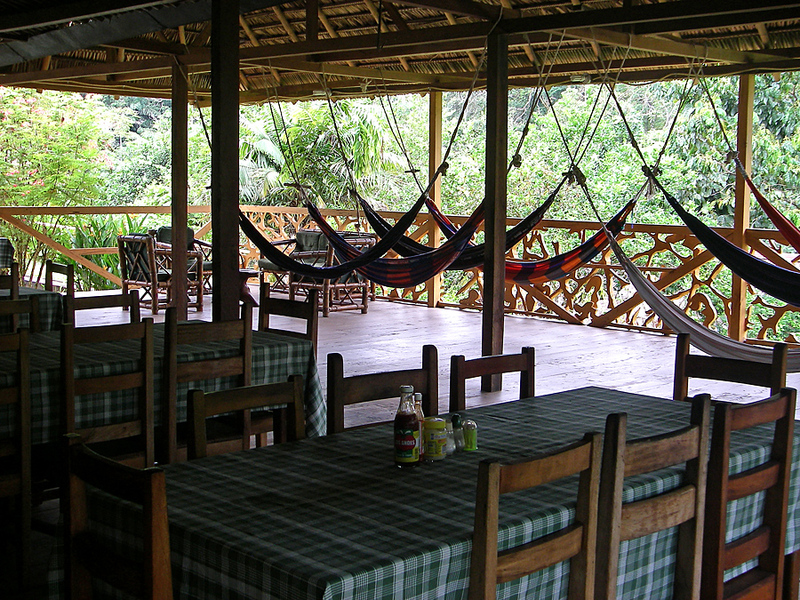 We were at the Jungle Lodge for seven days, and for five of the days, we did Spanish lessons. And we slept a lot. The heat and humidity make you very sleepy. One day we visited a Chechua home. More culture shock. I find I don’t do culture shock well. I have decided that there are two kinds of people in the world: travellers and non-travellers. I am a non-traveller. Though, I have to say you don’t often get to watch your Chechua guide reach into a swamp and pull out a crocodile. And damn, me without a camera. Esta es la vida. 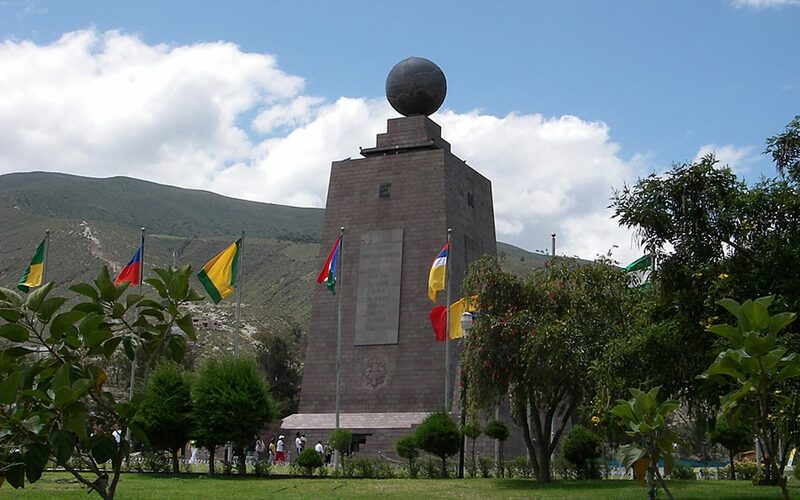 We returned to Quito yesterday, and we leave again tomorrow. Somehow we keep bumping into people we have met before. It’s that kind of place. 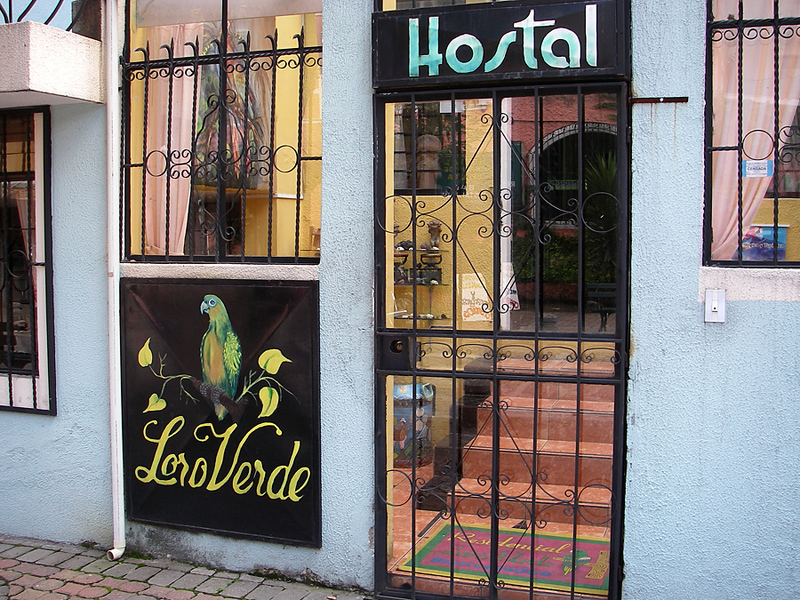 We stayed at Loro Verde. 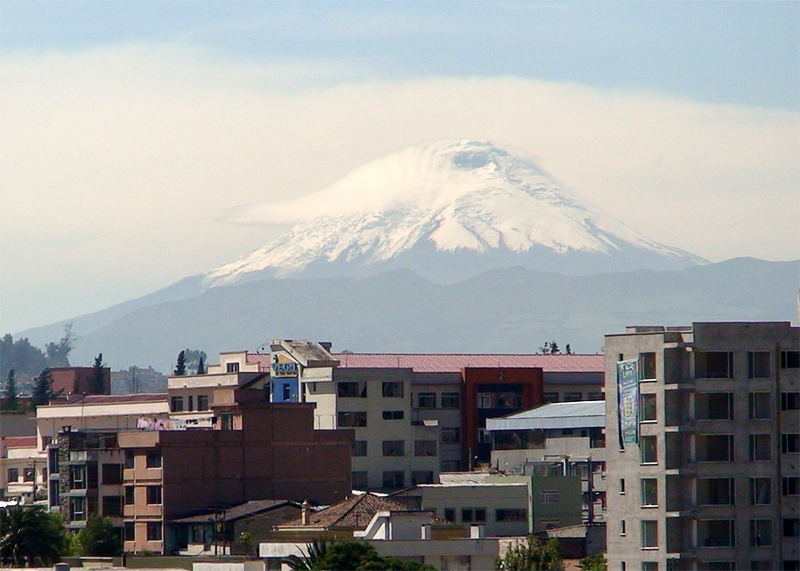 In Quito, you can sleep. Last night was the best sleep I’ve had in three weeks, with the temperature under 20 degrees Celsius. It was heaven. And my stomach is starting to feel semi-normal. Today, we did errands. First we found a shoe repair, and got Rolf’s sandal fixed, and his back pack mended. While waiting, we talked to the guy who was polishing shoes. This started in Spanish. Then the guy started using English. Rolf spoke Spanish and Bradley spoke English. Bradley was born in Los Angeles, of American dad and Ecuadorian mom, but he likes living here. Part time he works in the shoe repair place, polishing, and part time he works as a guide at the Explorers. He asked us where we were from. Alberta, I said. He knew of the place because, he said, Alberta is where the Titanic sank. He told us he knows all this stuff because he reads Watch Tower magazine, and then he began telling us about the Jehovah Witness. Rolf didn’t mind because he was getting Spanish practice. The backpack and sandal were repaired quickly, and all for $2. Rolf tipped the guy a quarter, for being so rapido. After that we headed for the school, La Lingua, to pick up our certificates for doing 100 hours of Spanish. We had lunch with the director and her husband, and that took about three hours. Time moves at a different pace here. Now, we are at La Sala, using the computers. It’s about 6:30 and time to decide on a restaurant. I’ll find Rolf and see how he’s doing with his emails. Tomorrow, it’s the bus to Cuenca, for eight hours. I can’t say I’m looking forward to it, but apparently there is this incredible scenery that needs to be seen. I have seen so much incredible scenery I just don’t know if I have room for more. Hopefully, the bus won’t fall off the cliff and I will be able to write more emails. This bus trip is, I think, the last major adventure component of the trip. 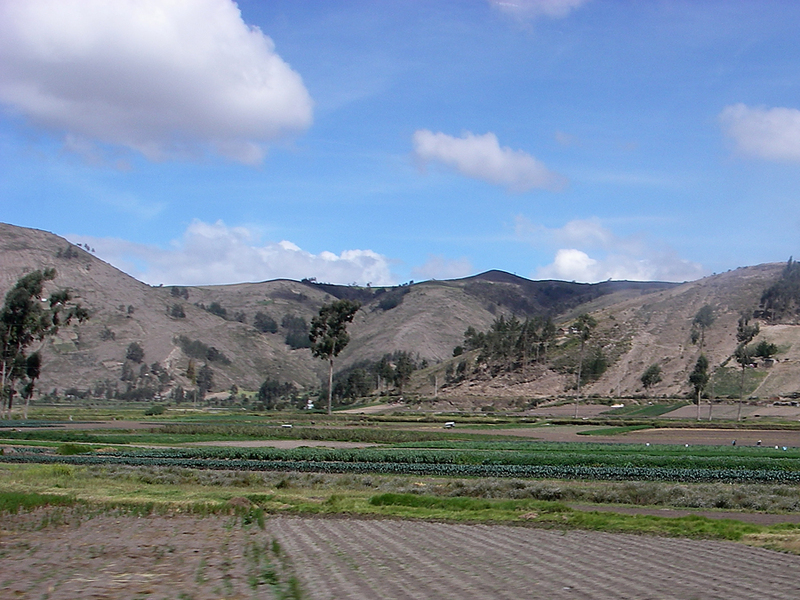 We will take another shorter bus to Vilcabamba and then fly back to Quito. Oh yes, now I remember. There is one more adventure after this. We will do our last week in Baños, where Tungurahua is smoking. The volcano has not blown up for about eight years, and if it does while we are there, hopefully the wind will be blowing the right way. 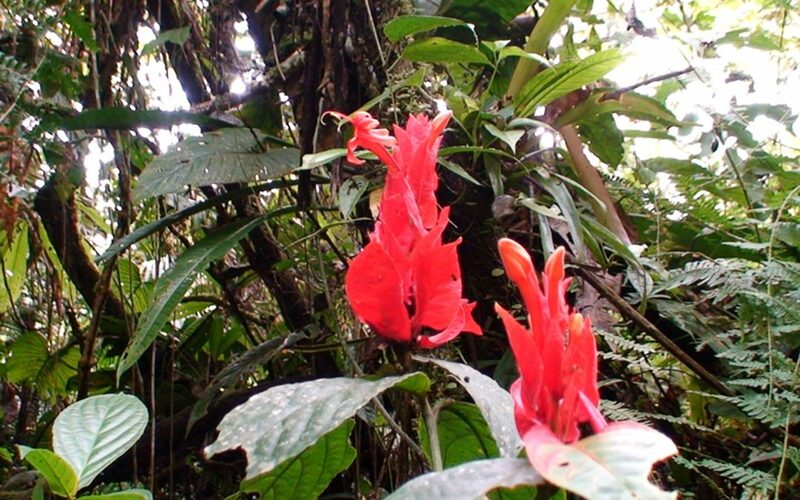 The story of my 2007 Ecuador adventure continues. This is a letter I wrote home about my last days of school and homestay in Quito, Ecuador. Before I show you the letter, let me show you some roses. 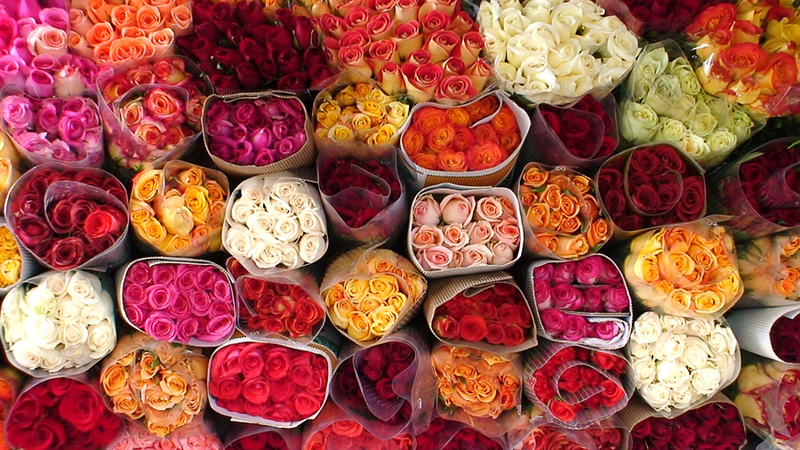 In Ecuador, roses are an industry and they are shipped all over the world. On the street, they cost a dollar for a dozen. 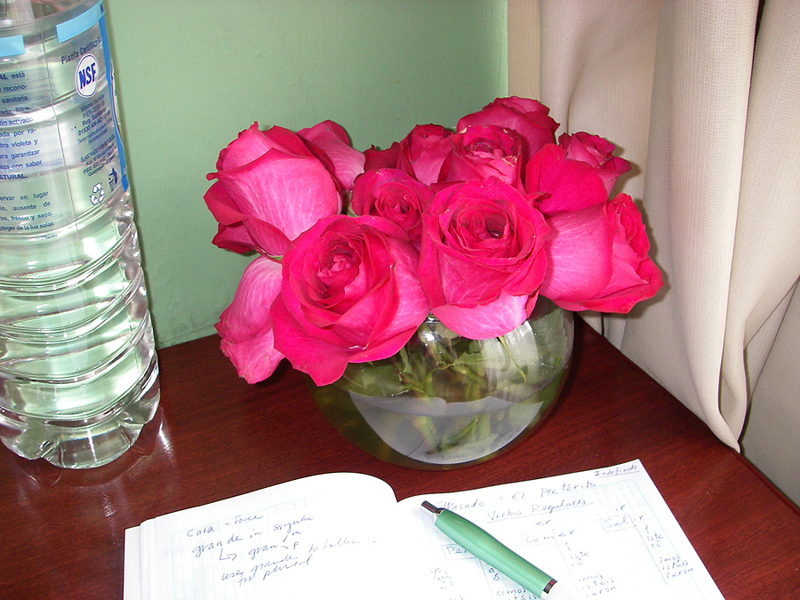 Roses on the street . . .
. . . and roses in my homestay room. Look at how the time flies. I haven’t written a letter for a few days. I should try to do that now, although I never know where to begin. 1. I am SICK of homework. Enough already. Tomorrow is the last day of four weeks of Spanish classes. I know more than I started out with but I have miles to go to be anywhere near as good as Rolf is. Celebration on the last day of school. 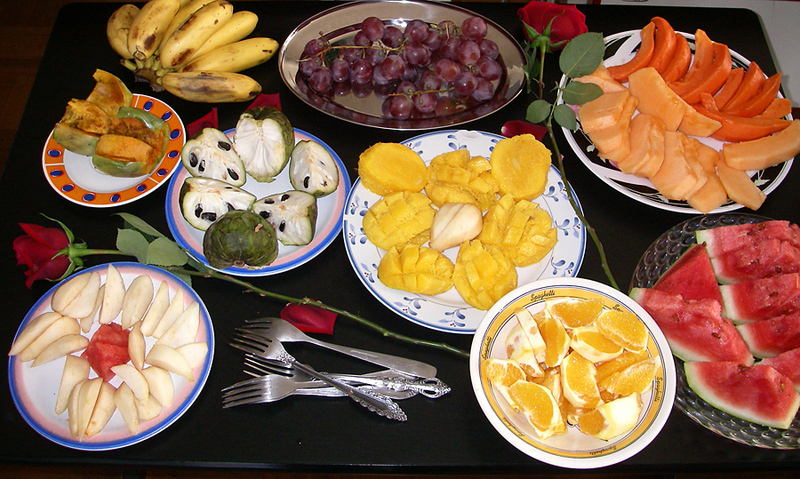 Local fruits. 2. Salsa classes have wrapped up. Eleven classes and five instructors. Again, I know more than when I started. Easy to say, since I knew nothing to begin with. When I get home I want to sign up for classes, maybe for ballroom dancing. I like line dancing, but I like this “partner” dancing too. So many dances to learn, so little time. 3. I am sleeping well, or at least better than I was four weeks ago. I no longer really hear the car alarms. They love car alarms in this country. At the Mitad del Mundo (equator) there was an amusement ride for the kids (niños). It was a ring of little cars, going round and round, and each had its own unique car alarm. 4. I’m getting better at crossing streets. The cars seem to speed up when you set your foot in the street. 5. I am more used to living with a homestay family. The other night, I was finishing my homework at the dining room table and watching TV at the same time. My family never turns off the TV. So it’s me and the ten-year-old Feorella watching TV and doing homework. The 67-year-old is playing solitaire with real cards. And the son (Feorella’s dad and the homestay mother’s son) is polishing silver. The other two students (Switzerland and Germany) are out having cervezas. I’m watching this B movie that has voice-over in Spanish. It’s weird watching it. Of course, the lips and the voice do not sync. And I’m thinking, this movie is using some devices that I have seen before. Maybe all movies (especially B movies) borrow devices. And then it’s getting to the end of the movie (which I am following even though it’s in Spanish) and the Swiss student comes home and tells me that it’s called FORTRESS and he saw it in English and it’s just as bad in Spanish. At the very end of the movie I realize that I have seen it too, only my brain is so fried I didn’t remember. 6. What else. I like this little neighbourhood: Gringolandia. It’s really called Mariscal Sucre. I know how to find the school, the laundry, the internet, and four restaurants for lunch. And a really good tailor. Rolf needed a tear mended so his shirt would last the rest of the trip. I had already mended the other side of this shirt in Canada. The tailor fixed the new rip, and redid my repair, so that you’d never know the shirt had torn, and he charged $3 for this major craftsmanship. He works in this little hole-in-the-wall place with an antique sewing machine. An old guy. Muy amable. Very friendly. 7. Tomorrow is Friday, and as I said, the last day of classes. 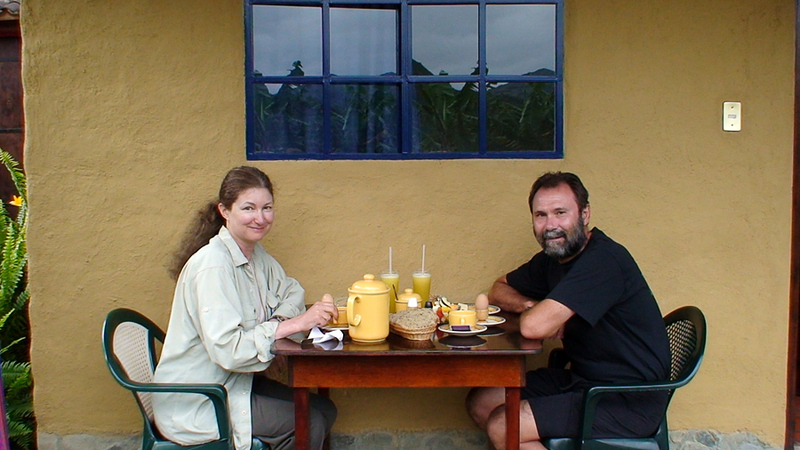 Then early on Saturday morning, we catch a cab for the airport and head out to the Galapagos, about 1000 miles from here. We go from about 10,000 feet to sea level and I’m hoping I can breathe better there. And I’m hoping the heat is not going to be a problem. 8. It’s weird living in all this noise. Car stereo bass throbbing, the music in the internet café, the car alarms, the band across the street, the endless milling people, the horns. I really like this internet place, La Sala. The other night, the city blacked out and it was strange to suddenly have it quiet in La Sala. There was no power for about twenty minutes and they lit candles. Candles and computers. That’s Ecuador. I’ll check in while I’m in the Galapagos.